1. 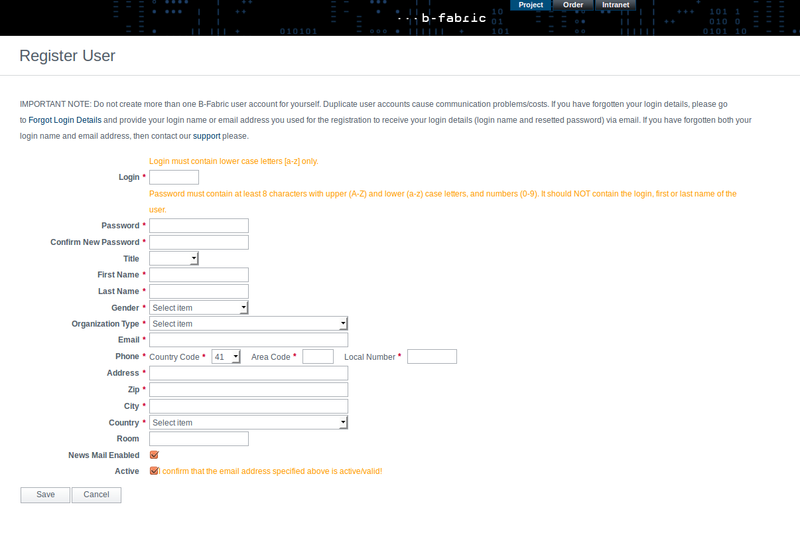 To register a new user in B-Fabric you can either go to the welcome page of the B-Fabric Project module or the welcome page of the B-Fabric Order module. Then click the 'Register' link. 2. Fill in the registration form. It is important that the information you enter is correct. It will be used for correspondence (i.e. for invoicing). Fields indicated by red dots are mandatory fields. Several fields have restrictions that are described below. Password The password must contain at least 8 characters. It must contain at least one upper case letter (A-Z), at least one lower case letter (a-z), and at least one number (0-9). It must NOT contain the login, first or last name of the user. The use of ' ' (whitespace) is NOT allowed. Organization Type In the Organization Type dropdown you can select between University and Company. If you select University additional input fields/dropdowns will appear to select your Organization, your Department, and your Institute. If you select Company you will get input fields to select your Company and your Division. Add a new Organization, Department or Institute If your Organization, Department or Institute does not appear in the drowdown list you can create it using the corresponding 'Add' button. Before adding a new Organization, Department or Institute please make sure your that it does not yet exist. Active By selecting this checkbox, you confirm that your email address is valid. It is important that you enter a valid email address that you use frequently, because a lot of communication in the userlab or during the order process is done with email. 3. Save the registration form. When you save the registration form an account for you will be created. You will also receive a confirmation e-mail. Created by akal. Last Modification: Friday February 27, 2015 17:48:29 CET by uguerel.